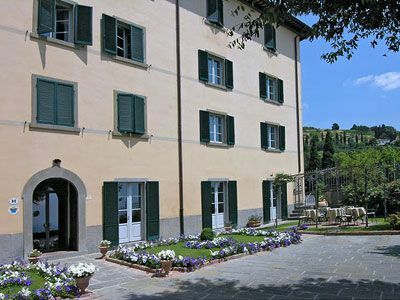 Villa Marsili is a four star hotel located just 4 minutes walk from the historical centre of Cortona. The building, originally an ancient 15th century Church, was converted into a patrician “Palazzo” (Villa Marsili) in 1786. The recent renovation of the villa has allowed the recovery of architectural and stylistic features lost over the centuries through earlier restoration. Villa Marsili offers guests a breakfast buffet with a rich selection of our Tuscan specialties and from 7.00 p.m to 8.00 p.m, guests may enjoy a drink served in the hall of the hotel or in the garden terrace with its atmospheric view of Valdichiana valley, accompanied with appetizers. We have always thought of this hotel as a private residence, and therefore we have tried to make it as much comfortable as we could: warm, rich in details, in order to offer you the best comfort, allowing you to rest if on holiday and to concentrate if on business. We look forward to contributing to your well-being. The Hotel Villa Marsili is located within the walls of the ancient town of Cortona.